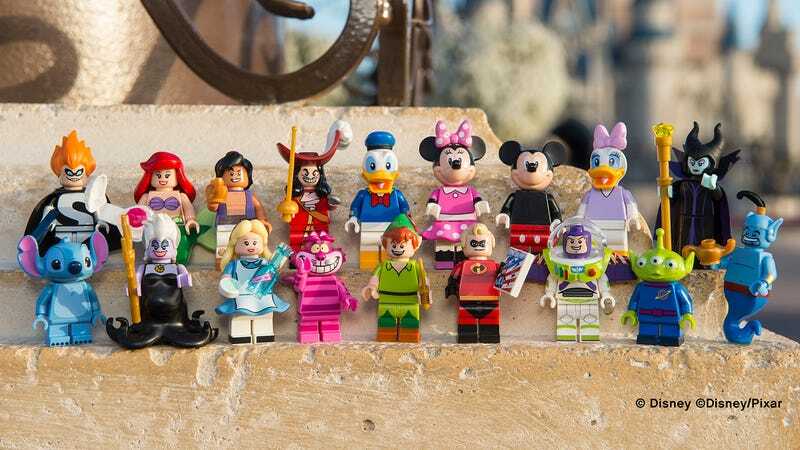 The news first leaked out a month ago so it doesn’t come as much of a surprise, but today Lego officially revealed its next Minifigure collection that exclusively features characters from the world of Disney, including Mr. Incredible and Syndrome making their first Lego appearances. Available in stores and online starting on May 1 for $4 each, the official reveal confirms the new collection will also include Mickey Mouse, Minnie Mouse, Donald Duck, Daisy Duck, Alice, the Cheshire Cat, Peter Pan, Captain Hook, Maleficent, Ariel, Ursula, the Genie, Aladdin, Stitch, Buzz Lightyear, and Pizza Planet Alien. Does this mean that follow up sets will include other Disney characters given the company’s vast repertoire of films and cartoons? Hopefully. We wouldn’t mind a Duck Tales set, or maybe even a few characters from Darkwing Duck too.